All of us that work at Freshpet are pet lovers of the highest order; it’s almost a requirement in order to be employed here! So when one of us gets the chance to take care of a pup or kitty, even for a little while, we immediately volunteer. And that’s exactly what our Social Media Manager Zack did this past week. Jackson is a little terrier mix adopted from the North Shore Animal League in Long Island, New York. When he was first adopted, Jackson was a bit skittish and territorial. But he’s become quite the little social pup since his adoption a year ago. But nowadays he spends his time living in Brooklyn with his mom. This past week, she was headed off to Hawaii on vacation and asked Zack to take Jackson for 10 days. As a dutiful godfather to Jackson, he immediately said yes. For the next couple of days Jackson stayed in an East Village apartment, where he waited patiently for Zack to come home every evening. But a small apartment is no place for a puppy to spend all his time, so Zack decided to bring Jackson to the Freshpet offices with him as an unofficial “intern” of the digital marketing team. The whole office welcomed him with open arms, with everyone coming over to meet the newest member of the extended Freshpet family. 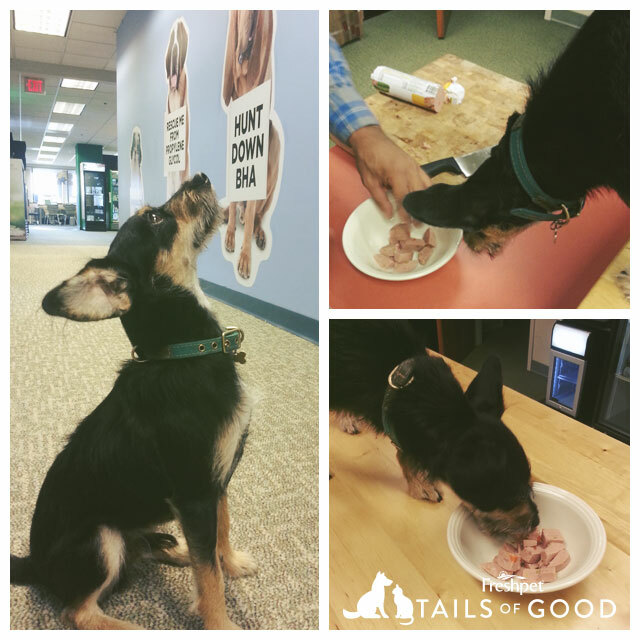 Jackson spent his two days at the office running around, exploring, and (of course) eating a lot of delicious Freshpet recipes! Though he is generally a finicky eater, he couldn’t get enough of our Freshpet Select Chicken, Vegetable and Rice recipes and loved chewing on our Dog Joy Turkey Bacon treats throughout the day. Needless to say, he was sent home to his mom with a goodie bag from his new friends at Freshpet. We can’t wait until the next time he visits! If you know of a pet or family member who deserves a Tail of Good, we want to hear from you! Email us at [email protected], or send us a message on Facebook or Twitter.